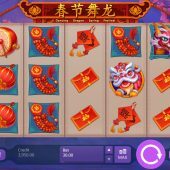 Dancing Dragon Spring Festival slot is unsurprisingly a Chinese - themed game but with a difference. Colourful graphics means that all symbols are pictorial rather than the basic card letters we often see and there certainly can be fire in this slot, but not in any feature, simply the base game. Behind the soothing and gentle oriental music a beast may awaken! There are 30 pay lines over 5 reels of 3 rows and the slot has 'adjacent pays' in other words 3 or more consecutive matching symbols on any of the pay lines awards a win, so that can be on reels 2, 3 and 4 or 3, 4 and 5 as well as the first three. Given that we have stacked symbols Dancing Dragon has some similarity to games such as Novomatic's Power Stars but without Wild reel respins. There is a stacked Wild but only on reel 3 and as there is no multiplier it may seem irrelevant to some in that you have all symbols stacked 3 rows high on all reels anyway. There are scatters but these Dragons are simply stake multipliers and trigger no feature. You get a handsome 100x stake for 5 of them though and for a pair anywhere 2x stake. The big value lies in the top - paying symbol the Horned Dragon. 5-of-a-kind of these pays 166.67x stake so if a full screen were to land you will win the game's maximum prize, a colossal 5000x stake! This is ten times more than the second - highest paying character so wins with it will be at a premium.